Climate change is bad, beef is bad, everything is bad, yadda yadda. But Americans ate less beef between 2005 and 2014, which kept a lot of greenhouse gases out of the atmosphere, according to a new study. Maybe cutting back on those hamburgers is actually doing something good for the environment. The Natural Resource Defense Council, or NRDC, released a report this month detailing how cutting down on beef consumption has actually reduced greenhouse gas emissions. I certainly won’t tell you to stop eating hamburgers, but these results might make you think twice before ordering the steak instead of the chicken or the fish. Cows produce greenhouse gases, and greenhouse gases drive global warming. It’s not just their methane-rich farts, although methane is a greenhouse gas roughly 30 times better at trapping heat than carbon dioxide. The entire agricultural process, from growing and picking feed to transporting it to feedlots, emits greenhouse gases. 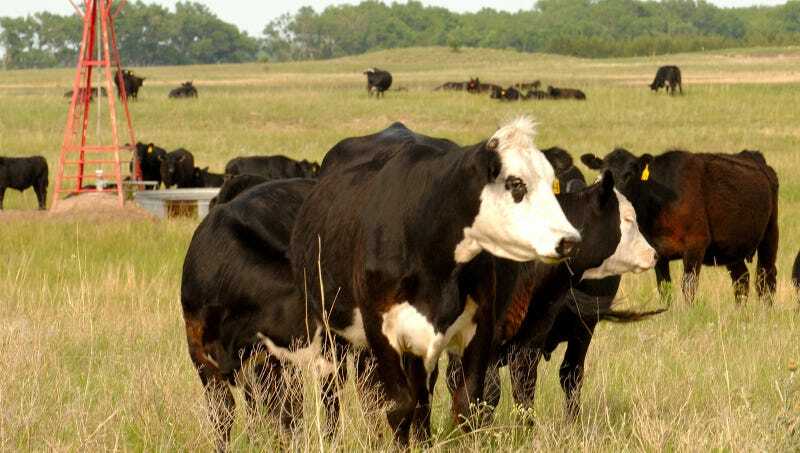 The NRDC ran some calculations and found that Americans cut down their beef consumption by 19 percent from 2005 to 2014, keeping 185 million metric tons of climate pollution out of the atmosphere, which they equate to the annual tailpipe emissions of 39 million cars. Our overall dietary changes equated to a nine percent reduction in greenhouse gas emissions from food during this time. We’re eating greener. The report’s calculations are based on prior analyses other scientists have done, combined with 197 foods tracked by the United States Department of Agriculture’s economic research service and the Environmental Protection Agency’s emissions calculator. Even though our red meat consumption has declined, though, beef still accounts for around a third of our emissions output from food, equaling all other foods combined. Now, before I go on, full disclosure. I love meat. I will not stop eating it. With my biases in mind, I will point out that the NRDC is an environmental advocacy group, and it’s their job to put out these numbers, so they are obviously publishing with a bit of bias, too. I have no doubt that their numbers are accurate. But this is sort of a “see, look what could have happened” study to convince you to eat less beef. In reality, we don’t know what would have happened if our red meat consumption didn’t go down. Additionally, agricultural emissions are a small factor in the overall emissions landscape, equalling only around 9 percent of America’s total emissions in 2014. Globally, agriculture and forestry together still only account for about 24 percent of our carbon emissions. That being said, climate change is real and bad. Beef is not the biggest problem, and I’m mainly saying that because I like beef. Still, beef is definitely a source of greenhouse gas emissions, and if you’re concerned about the environment, switching to greener meats like chicken and fish and convincing others to do so definitely helps, although these protein sources have an environmental cost, too. But if you want to make a change and love hamburgers, don’t feel guilty. You can also drive less, use less electricity, raise your thermostat on hot days and lower it on cold days, and reach out to your lawmakers to enact policies that encourage industries to reduce their greenhouse gas emissions.